Planning Institute of Australia PIA has announced the winners of the 2015 Australia Award for Urban Design, with Western Australian projects and programs taking two of five main awards. Pleasingly one of those was in Fremantle with Fremantle’s Victoria Quay Enabling Precinct Plan taking the award for small-scale policies, programs and concepts. It aims to unlock the potential of Vic Quay, Fremantle train Station and Pioneer Park precincts of Fremantle Port to transform them. Well done to the Project Team – CODA, Fremantle Ports, Allerding & Associates, and Creating Communities. Brookfield Place, took out the main gong – the award for a large scale delivered outcome. The project transformed a block left vacant for 30 years into an inviting and engaging public realm. Nominations for the 2016 Heritage Council’s Heritage Awards are open. The Awards were established in 1992 to acknowledge the outstanding contribution of individuals and organisations to heritage in Western Australia. It also recognises those individuals that have been instrumental in elevating the value of heritage, securing its place in Western Australia’s future. Nominations close at 4pm, Monday 7 December 2015. The City of Fremantle is looking to rejuvenate Princess May Park in the Fremantle city centre and transform the park into a welcoming and safe place for everyone. The draft master plan(External link) proposes thirty six actions to improve the parks’ design, facilities and heritage buildings. Amongst these are: a central public walk way, new pedestrian crossing, new trees and landscaping, new play space, building conservation work, improved lighting and pedestrian paths through the park to improve connection through the park and beyond. A free Fremantle music event will be held this October as part of Mental Health Week to help break down the stigma surrounding mental health in young people. The Changing Your Tune event, supported by the Department of Local Government and Communities is the brainchild of the City of Fremantle, Fremantle headspace, The Youth Affairs Council of Western Australia (YACWA), Music Feedback and Unwind, who have joined forces to promote the ‘act, belong, commit’ message and raise awareness of this growing community issue. “Engaging and supporting young people is a passion of the City’s youth program and we are pleased to raise awareness of such an important issue in a way that young people can enjoy,” said Fremantle Mayor Brad Pettitt. The free event, to be held on Sunday 4 October at the Esplanade Youth Plaza includes a fantastic line-up of West Australian musicians including The Love Junkies, Coin Banks, Morgan Bain, Bernadine Grigson and Paulie Page. It also includes the launch of the Music Feedback CD Volume 7- a YACWA project that uses music to aid the mental health discussion with young people around the state. Free copies of the CD will be available on event day. ‘Music plays a very important role in many young people lives and can be a great avenue for opening up discussion surrounding mental health. Music Feedback gives musicians the opportunity to spread positive messages about mental health to young people, which in turn reduces the stigma associated with seeking help,” said YACWA CEO Craig Comrie. Also involved, is Fremantle headspace’s 17 – 25 year old led Youth Reference Group who were key to creating the youth-focused event. Other free activities on offer include a GAME of SKATE, live art, slacklining and appearances from other youth organisations. Julian and Ryan from Life Cykel turn coffee waste into gourmet mushrooms at their Fremantle Urban Mushroom Farm. What will 300 tonnes of coffee ground waste and mushrooms do for human and planetary health? Follow their journey to find out! Life Cykel is a new, locally owned, social enterprise using coffee ground waste to create Australia’s first Urban Mushroom Farm. Collecting coffee ground waste from Fremantle coffee shops, Life Cykel will grow gourmet organic mushrooms to be sold to local restaurants, food outlets and local markets. And no, they don’t taste like coffee! The City of Fremantle has jumped on board, already committing $15000 to the project. Now Life Cykel is calling on more like-minded people who believe local food, local economies and a greener future is what we should strive for. A unique concept to encourage more green spaces and fewer cars in city centres is catching on with of a number of Perth councils embracing pop-up parks. They are known as parklets – car parking bays transformed into small parks and public seating spaces. The initiative is part of a worldwide trend, with parklets being set up in more than 120 cities on Friday for International Park(ing) Day, to advocate for the better use of car bays. Originating in San Francisco, the annual event hopes to create more social inclusiveness and help shift the balance away from cars to pedestrians. Across Fremantle on Friday, that elusive car park may have been harder to find as more than a dozen teams competed to come up with the most creative use of the space. Themes included Go Dockers!, Didge Breath, Outdoor Reading Room and Park N Roll. Fremantle Mayor Brad Pettitt said there had been some resistance to losing car bays, but overall the concept had been largely welcomed. “It’s about creating green spaces in our city, but also new places where people can hang out in mini-parks and actually get to know each other and create a community,” he said. The pop-up parks are designed to be temporary, moving locations every few months. San Francisco-born Fremantle resident Jean-Paul Horré is now leading the charge for the concept to become more permanent. 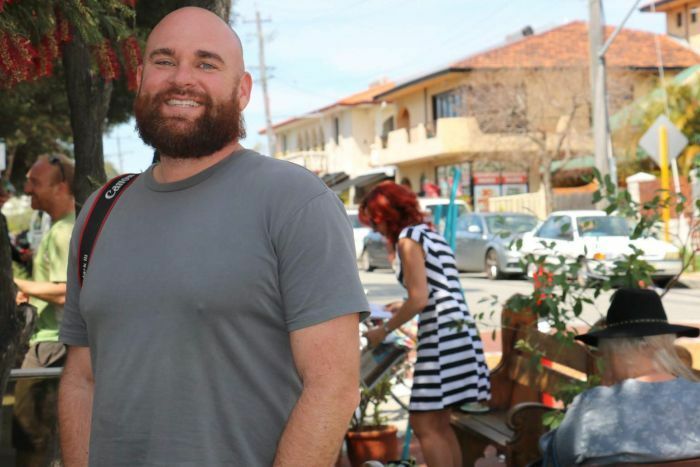 Mr Horré, along with his partner Annie Matan, a sustainability researcher from Curtin University, has put together a proposal for a solar-powered community parklet on Wray Avenue in Fremantle. “[It is] the first solar parklet in Australia that is going to be a permanent structure, and it’s a place where people can plug their devices in and charge off solar energy,” he said. The Wray Avenue parklet will be the subject of a crowdfunding campaign launched on Monday to raise money for reclaimed materials and solar equipment. The City of Fremantle has agreed to co-fund the parklet, matching up to $14,000 in sponsorship if the crowdfunding is successful. Local cafe owner Christian Ford was pleased with the impact the parklet was having on business. “Not just for me, I think it’s good for the street. I’ve noticed new faces and a lot of people wandering in and out of the shops so it brings new people to area,” he said. 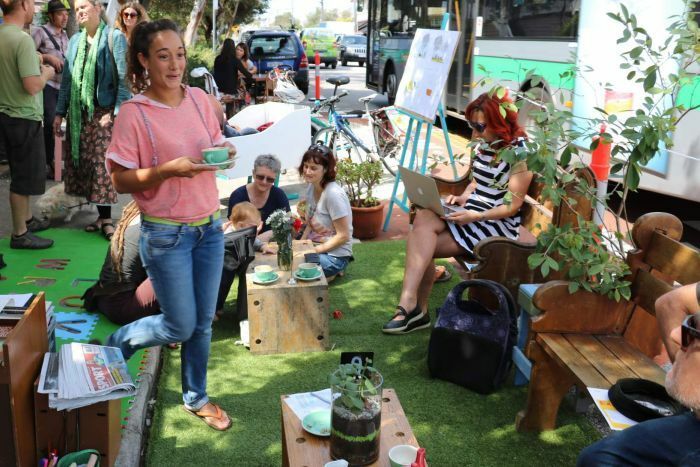 The idea is catching on around Perth, with businesses in Victoria Park and Leederville already using parklets to expand. 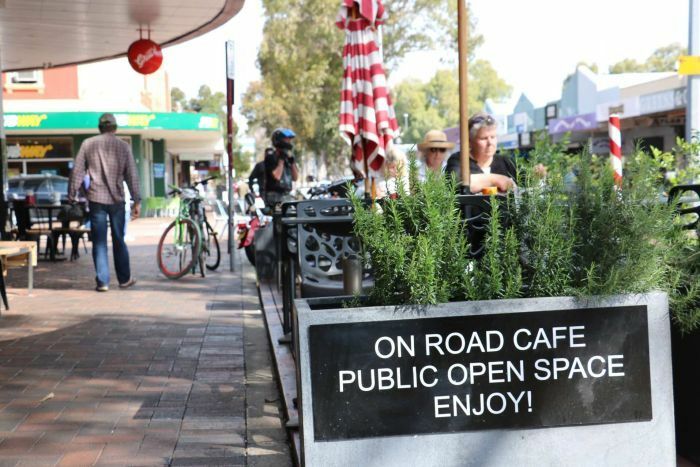 A parklet in front of a cafe on Oxford Street in Leederville was the first parklet the City of Vincent approved three years ago. The number of applications has now grown so much that the council has created a parklet policy, due to be adopted next week. The City of Vincent is also building its own parklets on street corners around town. I also put the ABC news video on Facebook here (I am having trouble uploading onto Youtube) and here is the article. Great day.